During the 19th Century, the Victorians encouraged 'popular' music believing that it brought not only happiness but also discipline and order. 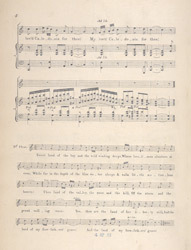 Lyrics could be calming and tunes could be soothing, and even the more rowdy songs taken from the Music Hall had humour as their inspiration rather than social reform. Piano music became popular in Scotland during the 19th Century, prior to this the Presbyterian Church had frowned on large instruments. The upright piano had been introduced in England and it quickly became available in Scotland too, along with pianofortes and bagatelles.